Couldn't make the show? At least you can find out how it was. Here's what normal everyday fans from each tour stop had to say about Tool. 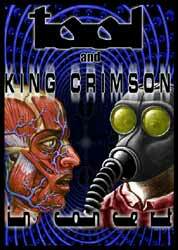 This was a special tour, only ten shows long, featuring legendary progressive rock outfit King Crimson. A total of 294 reviews were posted. For those who care, my own reviews of the two LA shows are posted to the August 13th and 14th Reviews pages. Reviews will open in a new window.